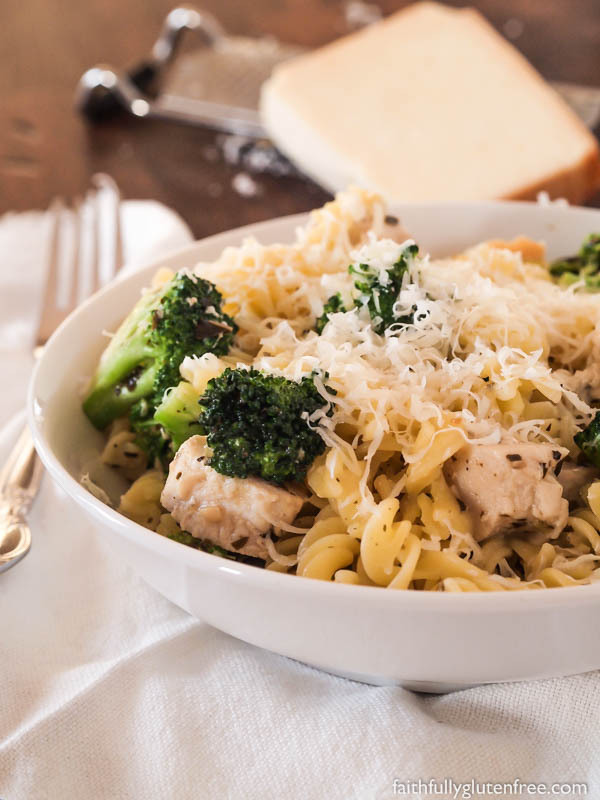 This gluten free Pasta with Chicken and Pesto is perfect for those nights you’re looking for a quick, tasty all-in-one dish. 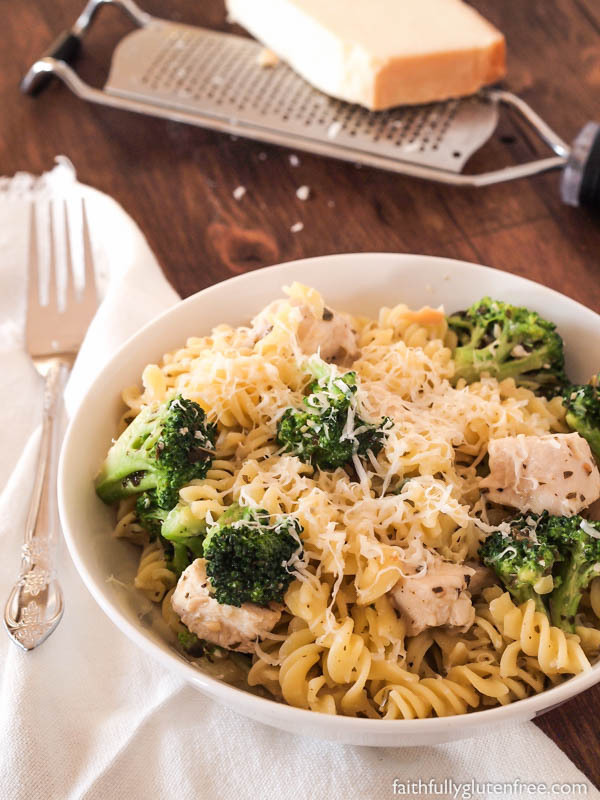 Pasta, chicken, and broccoli are tossed in a light sauce seasoned with pesto. 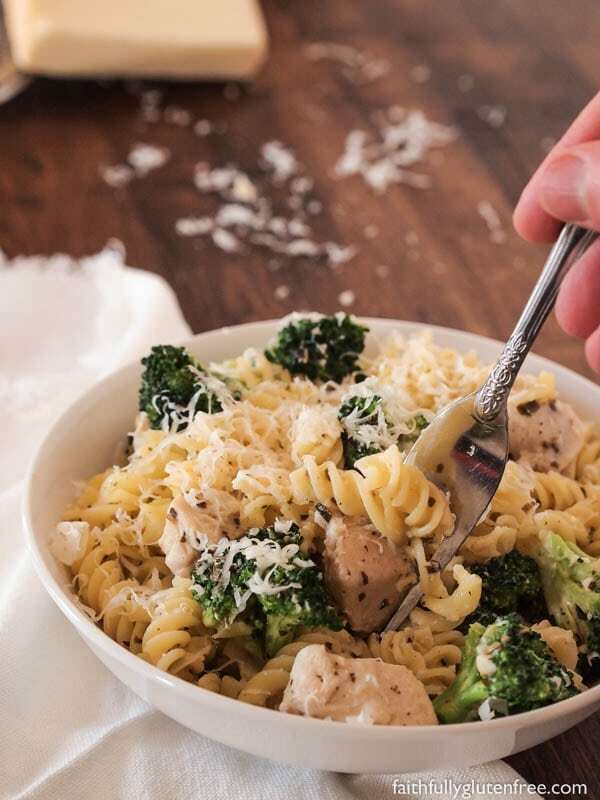 I love quick meals that can be made with ingredients I already have on hand, and this gluten free Pasta with Chicken and Pesto fits that description perfectly. I often stock a variety of pasta in my cupboard, because you never know when the need for a batch of creamy Mac & Cheese might hit. And having spaghetti and a jar of pasta sauce on hand has saved me from the dreaded last-minute “What’s for supper?” question more than once. This meal goes together in less than 30 minutes, but has a lot of flavour considering the few ingredients that it has. I’ve seen a few similar recipes, but they all used heavy cream in the sauce. Instead of having a heavy, Alfredo-style sauce in this dish though, I lightened it up by using milk and chicken broth. The pesto adds a really nice flavour to the pasta as well, and if you are growing your own basil, I’d suggest you try to make your own pesto. It really is easy to make, and you have complete control over the flavour. Feel free to switch out the broccoli with other vegetables, like peas or asparagus. Either would taste great with the chicken and pesto. Bring a large pot of slightly salted water to a boil. Add pasta and cook according to package directions, or until al dente; drain (I like to rinse my gf pasta with hot water, just so it's not too sticky). Heat olive oil in a large skillet over medium heat. Saute chicken and garlic until chicken is almost cooked. In a small bowl, stir together chicken broth, milk & cornstarch. Pour into skillet with chicken & garlic. Season with salt and pepper. Stir until it comes to a boil. Add pesto and half of the Parmesan cheese. Add broccoli and cook until broccoli is tender. Stir in cooked pasta, toss to coat. Top with the remaining Parmesan cheese and serve. 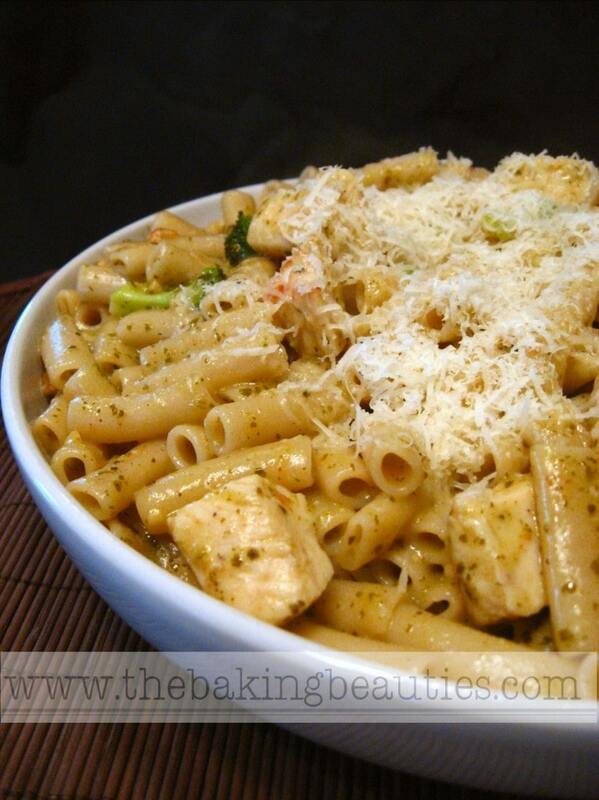 This recipe and images for the gluten free Pasta with Chicken and Pesto were updated in February 2018. 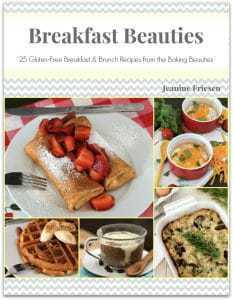 Okay I need a fork or is that a spoon I need:) Oh Jeanine that looks ever so delicious!! Oh my that does looks good and what a great supper. Great job seeing you didn't know what was for supper.. I'd love to see a dairy free version done! 🙂 Let me know if you get around to it, and what changes you made. It looks super delicious. I would probably prefer it without the cream as well. Oh yum! That's my kind of food. I need to make some pesto since I have a basil plant growing. I'll keep this recipe in mind. Thanks for participating in Gluten-Free Wednesdays. I made it dairy-free tonight, and I can vouch that it's delicious! Unsweetened soy milk in place of the dairy milk, and then vegan Parmesan in place of the dairy Parmesan. My brand of pesto was already dairy-free. Wow! This was delicious! My kids are sooooo picky, but they all raved about it. What is your favorite kind of gluten free pasta? I’m not really sure if I have a favorite brand, but I do know that my family & I all like using corn pasta instead of brown rice pasta. We just like the texture quite a bit more. Our favorite brand is Tinkyada. 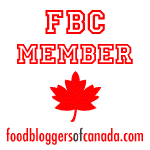 Jeanine, this is an amazing gluten free pasta recipe. They sure are hard to come by! I could also make this easily vegetarian for my husband, and still do a meat version for my children and I. Love that! I would be honored if you would share it on my Recipe of the Week #2 PASTA post! There is a gift card giveaway 😉 Hope you come join in the fun! Feel free to post any of your pasta dishes. We have made this a number of times and absolutely love it! We double the pesto, use peas, and have even used turkey instead of chicken and it’s great! We use whatever noodle we have on hand (tonight we used garden rotini). Thank you for sharing such a yummy recipe! I am off to Central Market to get some of this amazing pesto we sampled last weekend. After reading this recipe, I am convinced it will be fabulous in this dish. Now to make the choice between broccoli or asparagus… Thanks for tonight’s dinner extravaganza!! This really looks good, but I have a question. My friend is a Vegan and loves pasta. Can you substitute the chicken and Chicken stock with more veggies and Veggie stock? I would think it would serve 4-6. I usually serve our family of 4, plus leftovers. This dish is awesome! I made this for my family over the weekend and it was a BIG hit. Such great flavors blended together with a delicate sauce, and easy to make. Great comfort dish…will defilnitely make this again! Thanks! How many people did you serve? I served this dish for 4 adults with plenty for each and enough for leftovers. I think this dish could serve up to 6 people. It made alot! I also added a little chopped Roma tomato and basil on top before serving. Yum! I have to tell you this is now one of my go-to dinners to make! IT’s so good! Thanks for sharing!!! Oh – that sounds fabulous, Holly! Thanks so much for sharing how you changed it up!